This edited article about fashion originally appeared in Look and Learn issue number 451 published on 5 September 1970. Have you ever wondered why some old houses, even small ones, built during the Victorian era have wide doors? It was not to save bricks, nor was it because the house was built in a more spacious age. It was so that the women of the house could go in and out with their crinolines. Everything changes in fashion, particularly in women’s fashions, but nothing has changed more through the ages than the shapes and sizes of women’s skirts. At various times they have been long and loose, at others so tight fitting that the wearers could hardly hobble. They have been so huge and flounced and stuffed and padded with petticoats that they must have been a burden to wear, or they have shrunk and shortened until there is hardly anything of them at all. Some people think that the “mini” has had its day. What next, the “maxi” and the “midi”? Then will these more ample garments swell into ultra modern reincarnations of the cumbersome crinoline? 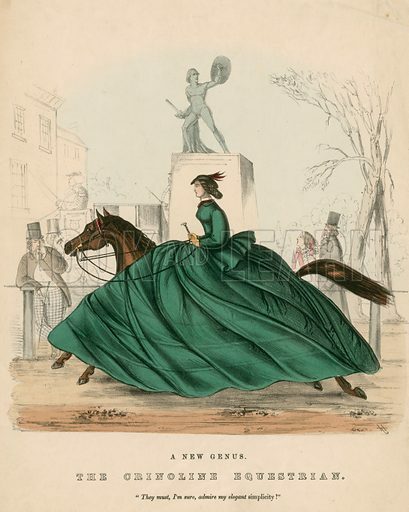 The crinoline first appeared in Paris about the year 1840. It was a wide skirt padded out with horse hair and linen. (“Crinis” is Latin for hair, “linum” for thread.) Previously dresses had been very high-waisted and very straight. At the start of this fashion skirts were padded out with petticoats. A cool two or three to begin with, but as the competition hotted up for the widest skirt, so did the petticoats, until young ladies at dances were suffering in the swirling midst of 14 petticoats! Once immersed in this sweltering array of linen they just had to stand. They stood in their coaches on the way to the ball, and they stood for refreshments and in between dances. For if they once sat down their crinoline and 14 petticoats would be crumpled and pushed out of shape. And what a shape they were! Writers of their own time said that women in crinolines looked like tea cosies or bells! To save weight and heat, attempts were made to stiffen the outerskirt with pneumatic tubes that were blown or pumped up like bicycle tyres. Some dresses had tubes filled with water, but these were disliked for fear of an embarrassing leak. Hoops of rolled horsehair, cane and wire were more popular, although they had the amusing effect of causing the skirt to swing from the waist like a bell, rising at the back if the lady stood too close to a table, rising high in the front if she sat down, and exposing her “ankles” almost to her knees when walking too close to a friend. At last, in 1856, all these problems were solved by the invention of the cage crinoline. The inventor was an ingenious Frenchman. He patented a device of wire spring and tape. There would be as many as 35 hoops in one cage. This edited article about the USS Nautilus first appeared in Look and Learn issue number 584 published on 24 March 1973. 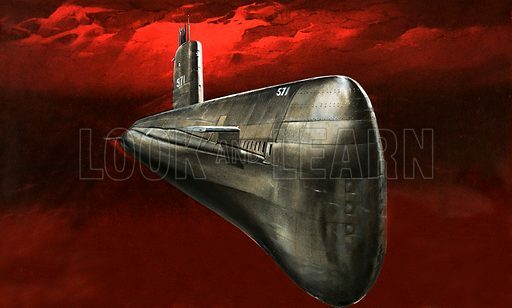 In 1870 Jules Verne wrote about a mighty submarine that could cruise thousands of leagues under the sea. He called it the Nautilus. On January 21st, 1954, at a Connecticut shipyard the dream of Jules Verne came true. As Mrs Eisenhower smashed a bottle of champagne against the dark green hull of the Nautilus, the world’s first atom-powered submarine slid into the water. Nautilus is 300 feet long, displaces 3,000 tons and cost £10 ½ million to build. Her atomic power can carry her round the world without refuelling. And her speed is in excess of 20 knots. When the cheers of the launching ceremony died away Nautilus went to work. Soon she was breaking records and in 1957 came a voyage of exploration as exciting as any that man has known. The brief of her captain, Commander William Anderson, was to explore beneath the ice packs of the North Pole. The rasp of the diving alarm sounded and for the first time Nautilus edged under the ice. Somewhere in the ship a juke-box was playing. Off-duty members of the crew relaxed in their almost luxurious quarters. In the mess another group were eating dinner. Meanwhile in the control room, Commander Anderson wondered what they would find below the ice. It wasn’t long before the answers to questions that had been puzzling scientists for many years began to arrive. By means of a sonar machine scientists on board were able to form a very good picture of what the ice overhead was like. A sonar machine is a device that picks up sound and so enables the navigator to detect the presence of any objects outside his ship. This he does by listening for the echo made by an object in the path of a beam of sound. First they found that it was a huge, ever-moving mass of varying thickness. It was made up of floes ranging from a few feet to ten or twelve feet but not often more. The North Pole ice-pack is interspersed here and there with small lakes, little more than cracks in the surface. After cruising for some time beneath the surface Commander Anderson decided to attempt to bring Nautilus to the surface in one of these cracks. This edited article about Wilhelm Rontgen and X-rays originally appeared in Look and Learn issue number 793 published on 26th March 1977. Professor Wilhelm Rontgen, a physicist at Wurzburg in Bavaria, leaned over the tube he was experimenting on and carefully covered it completely with black paper. He had been working all day in his laboratory, and now it was late in the evening and getting dark. The tube he had covered so that no light could escape from it was called a Crookes tube, through which cathode rays are passed. Rontgen stared in disbelief. This was no ordinary light: it was bright green. But where was it coming from? The only possible source of light in the laboratory was the Crookes tube, which he had just covered with black paper. Now Rontgen groped towards the tube and switched off the electricity supply to it. At once the green light from the cardboard went out. When he switched it on again, the ghostly green light reappeared. Puzzled, Rontgen held his hand between the tube and the cardboard screen. To his astonishment, the invisible rays of light which were apparently passing through the black paper, now passed right through his hand and cast a shadow of his bones upon the cardboard. Rontgen had so little idea of what these rays were that he named them X-rays.